America's #1 eye cream* is now NEW & IMPROVED! *Based on mass-market sales through March 2007. **Results not comparable to professional procedures. ***Based on a consumer-perception study. †Based on a dermatologist-supervised clinical study. ††Awarded to original Clinical Eye Lift. **Awarded to orginal Clinical Eye Lift. "Many women start to experience sagging in the eyelid area as early as their late 30s or early 40s. 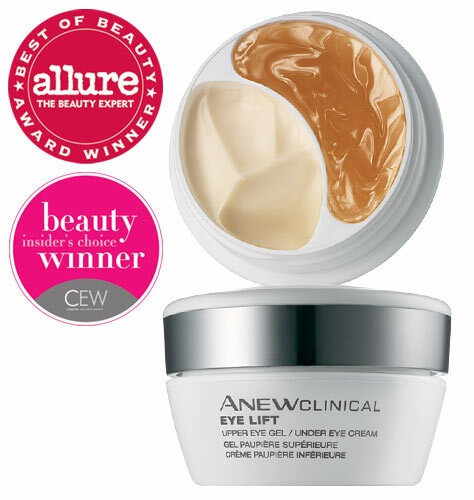 ANEW CLINIAL Eye Lift is a nonsurgical way to begin to address upper and under eye sagging with two customized formulas." - Rashida Poorman, Skin Care Expert with over 10 year's experience in skin care development & education. What a great idea getting a blog for your Avon business! I've been an Avon girl for years! Hi Karen! Welcome to the Club!